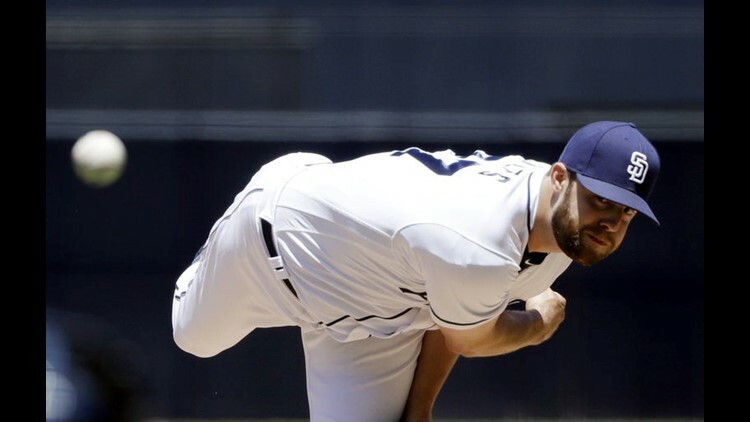 SAN DIEGO (AP) - Right-hander Jordan Lyles came within five outs of the first perfect game in San Diego Padres history before allowing a single to Trevor Story in a 4-0 victory against the Colorado Rockies on Tuesday. Lyles (1-1), who moved into the rotation last week, retired the first 22 Rockies batters before Story's single with one out in the eighth inning landed just in front of left fielder Franchy Cordero. San Diego is the only major league that without a no-hitter. The Padres have played 7,858 games since their expansion season of 1969. This was the second-closest a Padres pitcher came to perfection. Chris Young lost a perfect game bid when he gave up a homer to Gabe Kapler with two outs in the eighth at Milwaukee on Sept. 7, 2008. Tyson Ross lost a no-hit bid with two outs in the eighth at Arizona on April 20 when Cordero appeared to misjudge a ball by Christian Walker. San Diego was no-hit by four Los Angeles Dodgers pitchers on May 4 in Monterrey, Mexico. The 27-year-old Lyles was making just his second start. His first came on May 10 after winless Bryan Mitchell was demoted to the bullpen. Lyles lost 2-1 to St. Louis that night, allowing two runs and five hits in five innings. This was his 109th start in eight big league seasons. Lyles pitched for Colorado from 2014 until he was released on Aug. 1. He signed with the Padres a week later. Brad Hand earned a four-out save, his 12th In 14 chances. Lyles was backed by two-run homers by Eric Hosmer and Christian Villanueva. San Diego jumped on German Marquez (2-5) for a 2-0 lead after just six pitches. Travis Jankowski hit a leadoff single and Hosmer followed with a two-run homer to right-center on the first pitch he saw from Marquez. Villanueva homered off Chris Rusin with two outs in the sixth, his 10th. Franmil Reyes, who made his major league debut Monday night, singled ahead of Villanueva for his first big league hit and was replaced by pinch-runner Manuel Margot. Marquez allowed two runs and six hits in five innings. Padres: Rookie LHP Joey Lucchesi was placed on the 10-day DL with a strained right hip. Lucchesi (3-2, 3.23) said he had tightness in his glutes during Monday night's loss to the Rockies, which was his ninth start. Rockies: RHP Chad Bettis (4-1, 3.12) is scheduled to start the opener of a four-game series at San Francisco on Thursday night. Padres: Rookie LHP Eric Lauer (1-2, 8.27) is slated to make his fifth big league start in the opener of a four-game series at Pittsburgh on Thursday night.